Do you think Malcolm X would have seen post-9-11 America as rightfully defending our liberty, or do you think he would have seen our conduct in the world as further emphasizing X’s view of America as being a racialist society? I am not completely certain what Malcolm X, were he alive today, would say or feel about the attacks on America and our behavior since that day, but I do see parallels between the words in “By Any Means Necessary” and the way America illustrates those words presently in our post-September 11 behavior. My observation of recent racialism similar to what Malcolm X confronted started with expelling middle-eastern men from airplanes, preventing them from catching their flights. The excuse was that the ends of safety justified the means of racial profiling. For that same excuse, high-tech identification cards are being considered to keep tabs on non-citizens who match a certain profile–the ends of safety justify the means of racial profiling and violation of privacy. Without hard evidence, guilty until proven innocent, the assets are being frozen of people under suspicion of indirectly funding terrorist groups–the ends of safety justify the means of violating our constitutional rights against unlawful search and seizure. We would never allow for those held in Cuba to be treated as they have been if they were loyal Americans (and here comes Lili, wonder how they will be treated in this storm), and we attempt to get away with violating certain rights of our own American citizens accused of being affiliated with terrorist groups–it seems loyal Americans are the only humans who deserve to be treated as such, and have their innocence assumed until they are proven guilty. Afghanis died because we could not even get them from point A to point B without treating them like sub-human luggage. Does this not wreak of the near genocide of Native Americans, the segregation of Blacks, the Japanese-American Internment, blacklisting, and similar historical mistakes from which America apparently has learned little to nothing? America is still guilty even today of the double standard Malcolm X observed in our history, that “as long as a white man does it, it’s all right”. We attacked Afghanistan’s defenses against air attack, and we sent in cave-busters to kill those hiding in caves. We did this because the Taliban would not cough up Osama bin Laden without evidence of his guilt–but would we hand an American over to them without evidence of his/her guilt? We wouldn’t even negotiate and allow bin Laden to be handed over to someone less prone to treating bin Laden inhumanely once he was in their custody, of which there was already evidence of our guilt in that area. So we attacked Afghanistan’s defenses, a country who was no threat to us except that it stood its ground. And, initially, flying in the face of their religion, we named our actions “Infinite Justice” of all the words we could have chosen. Malcolm X says, “I have more respect for a man who lets me know where he stands, even when he’s wrong, than one who comes up like an angel and is nothing but a devil.” Unarguably, America did not care as much about terrorism in the rest of the world before September 11, but we went to great lengths to explain how we were not acting out of revenge, how we owed it to the world to do this. Apparently violent revenge is only acceptable from America–take violent revenge on America and you will feel the double-standard. Even now, President Bush is saying we owe it to the world to get rid of Saddam Hussein, using preemptive force if necessary (get them ‘before’ they commit a crime; forget innocent until proven guilty). When we separated from Britain, when we took charge of our inalienable rights, they did try to stop us from challenging their authority. For years we oppressed blacks and they did not have a voice–and how were their rights won?–and didn’t we initially punish them brutally for their rebellion? Is that what we are doing with revenge on the Taliban and Iraq–trying to stop them before they challenge our authority in the world, trying to make an example of them that we won’t be undermined? 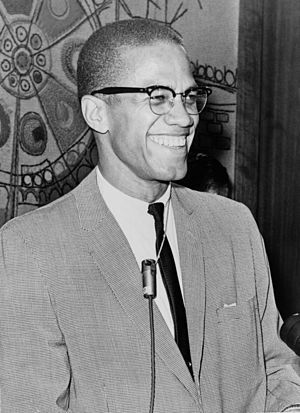 Would Malcolm X have condoned the demonstration of militant Islam the world was presented with on September 11, 2001–would he have considered it justified means necessary for a just cause, or would he have seen it as unjustified extremism, that the terrorists had no other motivation than their hate of freedom? I do not know the answer with absolute certainty. But I think we have demonstrated X’s point that we are fluent in the language of violence, and it is clear that we still to this day have a lot of work to do on how we interact with the human beings of this world. “By Any Means Necessary.” The Philosophical Quest: A Cross-Cultural Reader, Second Edition. Ed. Presbey, Gail M., et. al. McGraw-Hill, Inc., 2000. 630-633.